Mark Odegard still remembers his first time in Ennis – as a child in 1945, driving through on a trip to Yellowstone National Park. Later, his family would come out for a week every summer to fish and stay in the Riverside Cabins. After school and a career that took him all over the world, he made a more permanent move to Ennis in 2005. The Madisonian is excited to introduce its new editor John Taylor. 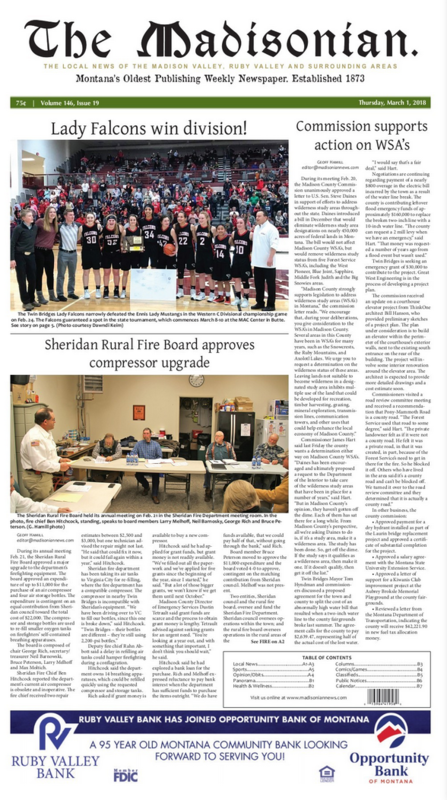 Taylor assumed his new role on April 26, after the previous editor, Geoff Hamill, transitioned over to the West Yellowstone Star, The Madisonian’s sister paper. Winter has been on the ground for seven months, with our first snowfall back in September. After the last dumping from Mother Nature the second week of April, I told myself if I ever meet a groundhog named Phil, who knows what might happen. In 1805 the Lewis and Clark Expedition paddled, poled, and cordelled eight dugout canoes up the Jefferson River. Today, Churchill Clark, the great-great-great-great grandson of Captain William Clark has returned to the Jefferson to carve a new dugout canoe with Tom Elpel at River Camp, near Cardwell. The U.S. Department of Health and Human Services’ Office of the National Coordinator for Health Information Technology has published the ONC Guide to Getting and Using your Health Records, a new online resource for individuals, patients, and caregivers. After the Soviet Union surrendered to Germany on March 3, 1918, the German strategy was to overwhelm the Allies in the West before the U.S. could muster large amounts of materiel and men to the war zone. General John J. “Black Jack” Pershing arrived in France in May 1917 and American forces had been deploying to France since the fall of 1917.